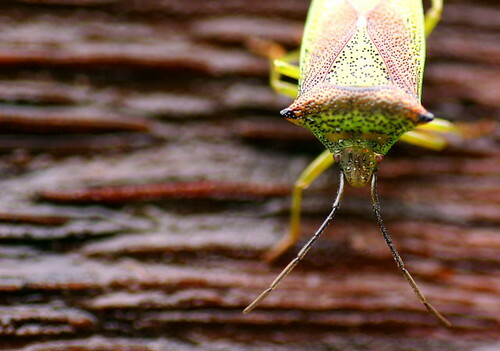 Shield bug or stink bug? Our colonial cousins across the pond favour the stink but us ‘say as you see’ Brits prefer the shape reference. Either way, we must all agree that they’re pretty much shield shaped and they do smell funny. The funny almondy smell they exude when they feel threatened, is a cyanide compound which rather predictably does deter predators. I’ve always thought it smelled rather nice and it turns out that in Laos, Pentatomid bugs from the same family as A. haemorrhoidale are mashed up with chillies and other spices and served as a tasty side dish. This is a very exciting post for me. I took these pictures 5 years ago with my first digital SLR and a newly acquired macro lens (a Tamron 90mm – which I still use) and was really pleased with the results. 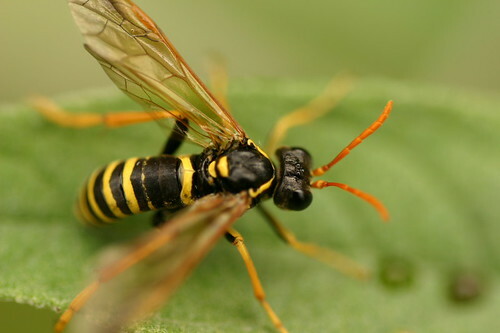 Looking at the yellow and black colour scheme and general shape and layout of this insect, I assumed it was a wasp, tagged the pictures as ‘parasitic wasp’ and moved on. Writing my ‘one a day’ species posts has made me examine my archive and really learn about what I’ve captured in my pictures. 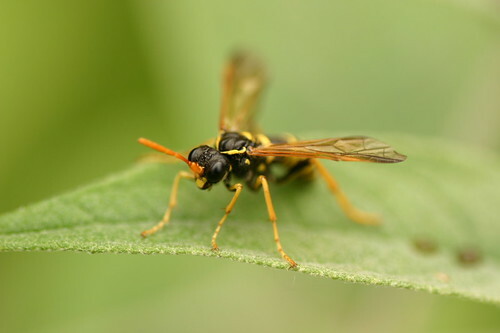 Although this species superficially resembles a wasp and is in the same taxonomic order, the Hymenoptera, which includes wasps, bees and ants, its actually from the sub order Symphyta – the Sawflys. This is exciting because it’s opened up a whole new set of creatures for me. I knew that sawfly larvae closely resembled butterfly or moth caterpillars but for some reason the adults were a total blank, a complete mystery to me. Well lets face it there’s a lot of invertebrates out there and obviously you could never recognize every individual species, but to have missed a whole sub order of the magnitude of wasps or bees was a bit of a shock! My favourite aspect of this series of photos is the clarity of the ocelli. These so called ‘simple eyes’ are the three round structures between the compound eyes. 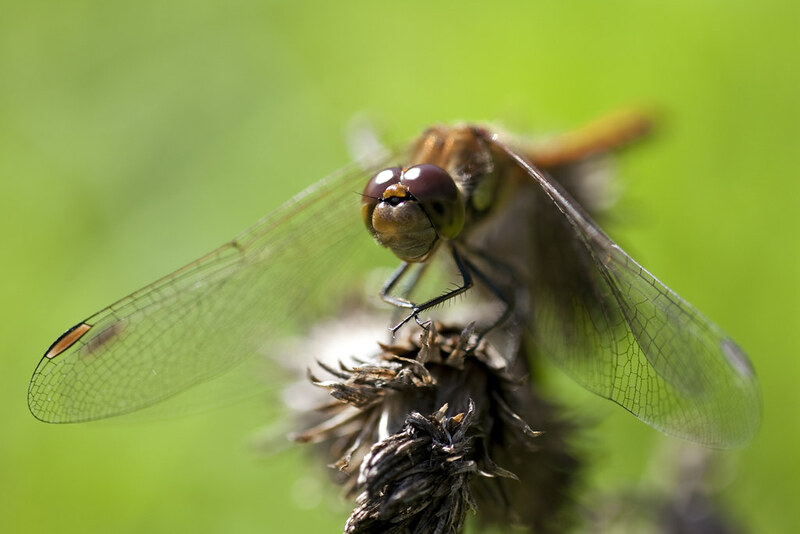 Lots of flying insects have these and as well as complimenting the compound eyes which are comparatively slow and less sensitive to light, they’re thought to play some part in flight stability and high speed orientation. Kind of a follow up to yesterday’s species and I’d obviously have preferred a female Common Blue for comparative purposes, but beggars can’t be choosers. 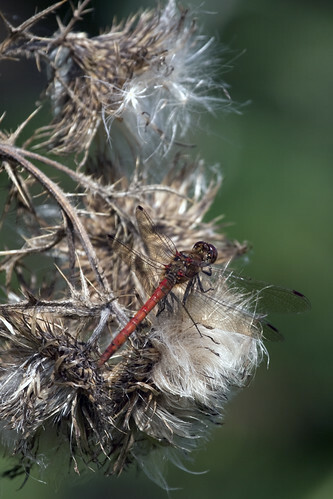 P. icarus is very common throughout almost all habitats in the UK and as such is pretty familiar to even the most casual urban butterfly spotter. Along with Large and Small Whites, Small Tortoiseshells and the odd Speckled Wood, they were a staple species for my earliest forays into lepidoptery. This male is nectaring on Bird’s-foot-trefoil (Lotus corniculatus), who’s leaves are also the main food plant for this species’ larvae or caterpillars. This is a nice illustration of the inter-relationship between insect and plant because the trefoil itself benefits by being pollinated as the butterflies feed. Brown Argus (Aricia agestis) or Common Blue? Whilst taking some exciting macros of yesterdays Dragonfly species, I was briefly distracted by this butterfly. I thought it was a female Common Blue (Polyommatus icarus), photographed it and got back to the Dragons, but when I got home and looked at the files on the big screen I started to wonder. 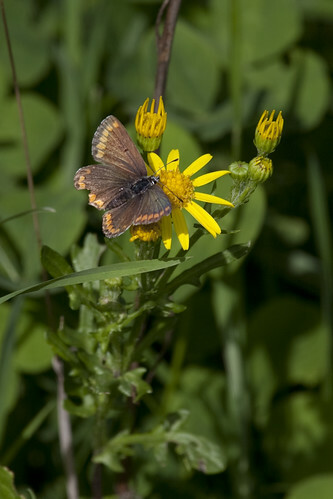 There’s more to ID-ing the Brown Argus than meets the eye. 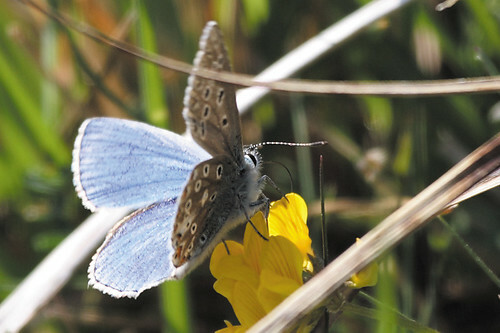 Mainly because the female Common Blue isn’t blue, she’s brown, mostly. Pretty sneaky eh? Of course, this cryptic colouration is not uncommon in the bird world, females often being dowdier than males, but it’s quite unusual among butterflies, except in the Lycanidea family, the Blues. To further confuse matters, the Brown Argus is also a Lycanid and so taxonomically at least, also a ‘Blue’. Anyway, the crux of the ID relies on some fiddly little details on which I had intended to expound, but this would be a bit esoteric without some comparative shots of a female Common Blue. I don’t have any of those. I thought I did, but funnily enough, when I came to look at them in preparation for adding them to this post, I discovered that they too were of a female Brown Argus. Instead I refer you to Steven Cheshire who has written a superb guide to identifying the two species, which can be downloaded from his excellent site www.britishbutterflies.co.uk. I’m indebted to him for this PDF as its helped me to add another insect to my species list and that’s always a good day, despite the fact that I’ve unwittingly already seen and photographed it! Continuing my series of Dragonflies and Damselfies, here’s the most often encountered species from the group of Darters. I managed to spend a couple of hours at my local dragonfly spot early this afternoon, hoping to make the most of a brief sunny spell before the threatened rain and the continued onset of autumn. 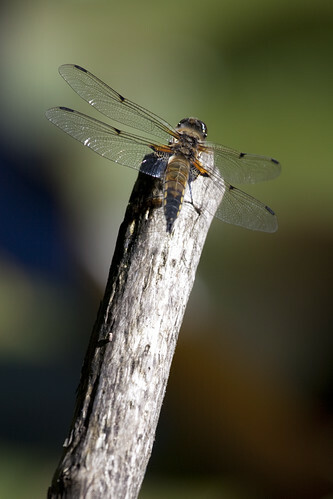 On the walk down, I was buzzed by a glorious looking Hawker racing along the hedgerow, swiftly followed by a less purposeful but equally un-photographable Darter. On arriving at the pond I set up the tripod and proceeded to be teased by a succession of Darters then cruelly mocked by a male Migrant Hawker (Aeshna mixta), who continually patrolled all around me, flatly refusing to land. Thinking I’d try my luck away from the water as the females often only visit the pond to actually lay eggs, I wandered over to the bordering brambly scrub. I immediately spotted what I though was a female Common Blue butterfly feeding on some Ragwort and got a few shots. On closer inspection this evening and much head scratching, they’re hard to distinguish, this turned out to be a female Brown Argus (Aricia agestis) which was another new addition to my all taxa list. Excellent! 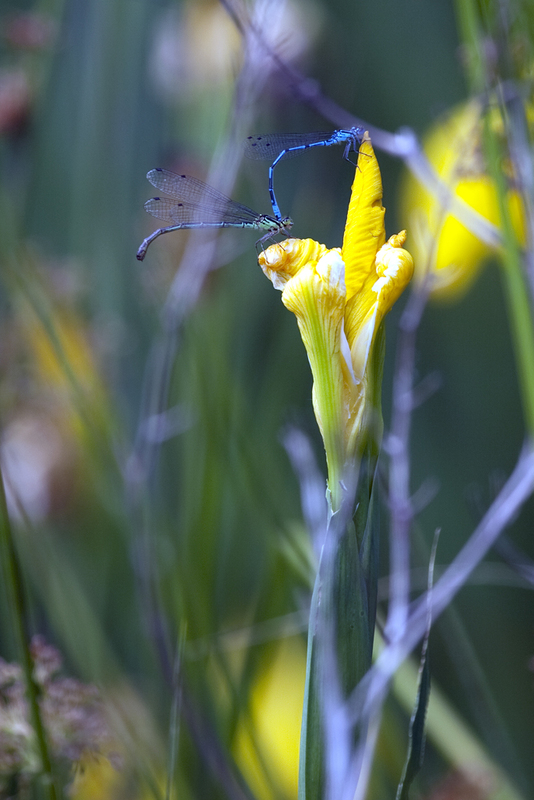 Whilst trying to photograph the future Argus, a Darter actually landed on my shoulder. Presumably to remind me what I was there for. The first picture is a head on close up shot of a female Common Darter (S. striolatum). It turns out that this is a very useful angle for ID purposes because the ‘facial’ markings are a useful distinguishing characteristic. 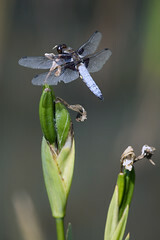 The second image is of the same species, but of a pair mating in the copulation wheel position. I think this picture this is actually genuinely brilliant as I’ve not even seen them in tandem before, let alone in cop, and to be able to get a really close up shot like this is a terrific insight into a pretty alien world -for me anyway. 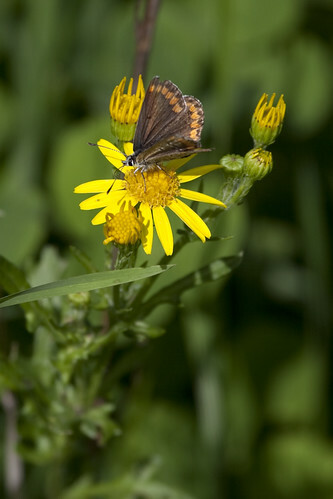 A common butterfly almost anywhere shrubs meet rough grassland. 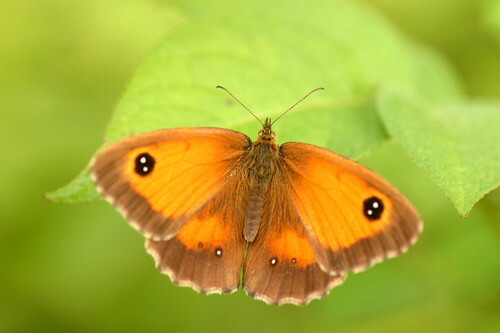 Superficially pretty similar to the related Meadow Brown (Maniola jurtina) but a little smaller, with a larger amount of orange, particularly on the hindwings and having two white pupils instead of one in the forewing eyespots. This individual is a female, the males have a very obvious dark patch of scent scales on their forewing. The larvae feed on grass species like Bents, Fescues, Meadow Grasses and Common Couch. 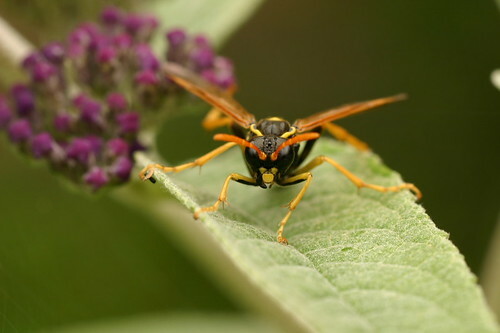 The adults feed on the nectar from a wide variety of plants including Privet, and Thistles and Brambles so their ubiquity, to some extent ,must be related to their fairly catholic tastes. The flight season is relatively short with adults having only one generation and being in flight from the second half of July up until the end of August. This is significantly less than M. jurtina which also only has one generation a year, but has a much greater flight period from mid June to late September. 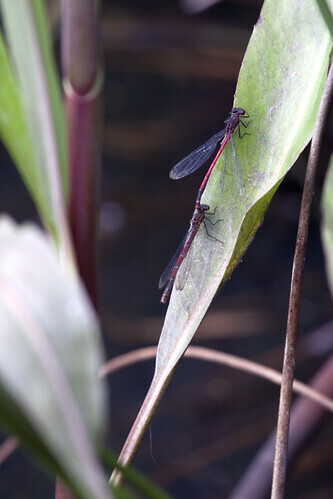 Although a common species, and the most likely ID if you see a red damselfly, this was the first time I’d seen any at our local pond. 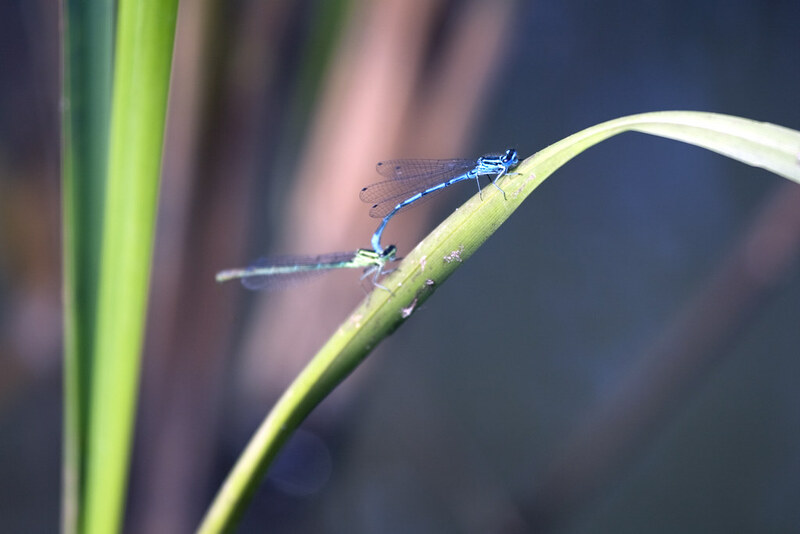 Seeing two dragonflies or damselflies joined together in the above position is referred to as in tandem and contrary to popular belief isn’t actually mating. The male clasps the female in this manner, he’s at the front, both before and after the transfer of sperm, which happens when the female curves the tip of her abdomen underneath the male’s thorax. 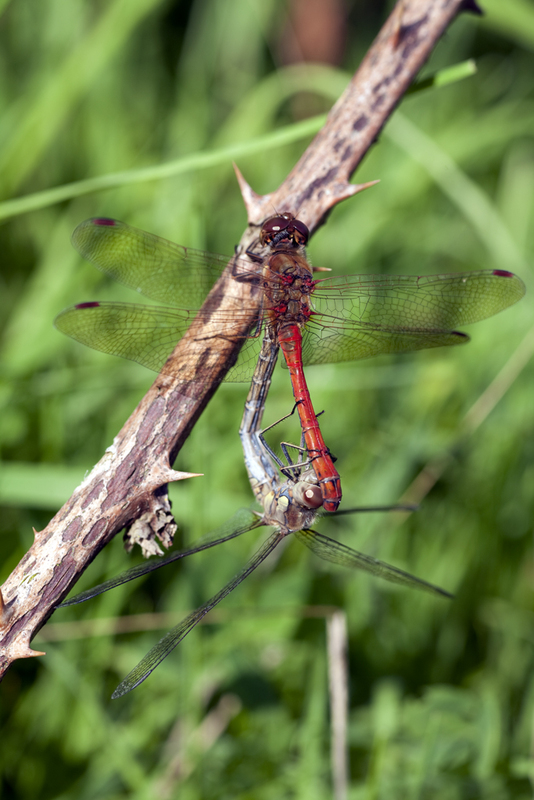 This position is called the copulation wheel and damselflies usually prefer to do it in a secluded position high in the trees or deep within bushes, so its rarely observed, whereas dragonflies are more brazen and some species will fly around openly ‘in cop‘. On the same day I took this photo I also shot the HD video of Saturday’s One a Day species and used exactly the same camera for both – my Canon EOS 5D Mk 2. Isn’t modern technology amazing? Here are a few other shots I took that day including yet another One a Day species in tandem. A bit of a bumper Saturday night post, two species of the day for the price of one in full HD video! 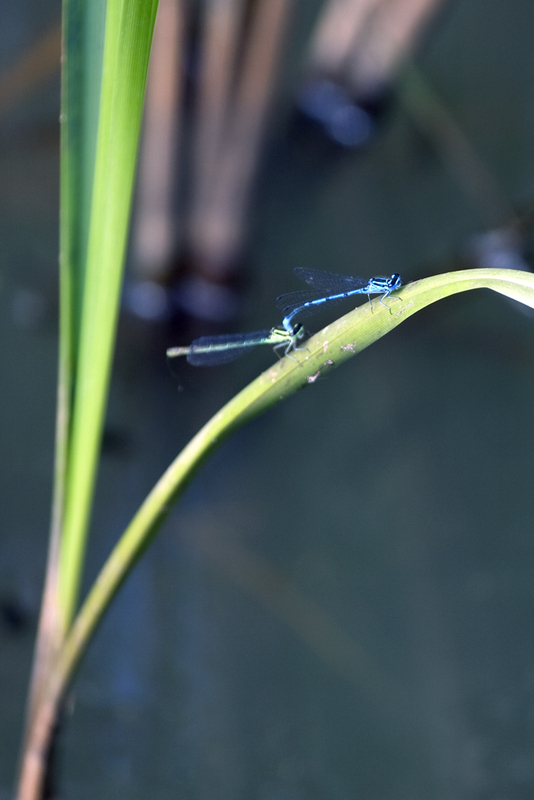 The first part of this film features an earlier SOTD post the Azure Damselfly (Coenagrion puella) but the really good stuff in the second half features L. depressa the Broad Bodied Chaser, ovipositing (egg laying) in my local dragonfly pond. Although pretty familiar with fellow genus member Libellula depressa the Broad Bodied Chaser, which will soon feature in a fuller post, complete with HD video, this dragonfly was a new one on my species list. They’re not uncommon, but my regular dragonfly hunting ponds don’t suit them for some reason, so I was pleased to find plenty of these around a different local pond earlier this summer. They’re pretty big insects, up to around 5cm and very active so quite easy to spot. They also have the habit of repeatedly returning to the same perch rather like Broad Bodied Chasers, which obviously helps the photographer. Unfortunately this individual kept returning to the end of the same stick in almost exactly the same position, so although I was able to get quite a few pictures, they were more or less identical. A little positional variety would have been nice and a macro lens would have been even nicer as this individual was far too intent on hunting small flies in the late afternoon sun to worry about me. Having no waders with me, I had to stick to the telephoto zoom lens as the favoured perch was a little too far into the boggy margin, but then that’s kind of why my wife bought me the zoom in the first place. We’ve left a few patches of longer grass around the garden this year, allowing it to mature and flower and I’m convinced this is part of the reason we’ve had such a bumper year for several insect species including C Brunneus. Creating another more accessible habitat like this, alongside the more established wilder parts has been pretty rewarding, since by their very nature, the wilder areas are left to their own devices. By contrast, areas of longer grass are easy to rummage about in and provide cover for a wide variety of creatures from grasshoppers, beetles and crickets right up to birds and Rabbits. Toddlers are also pretty fond of them. The familiar chirping of grasshoppers has been a welcome addition to our local sound scape. 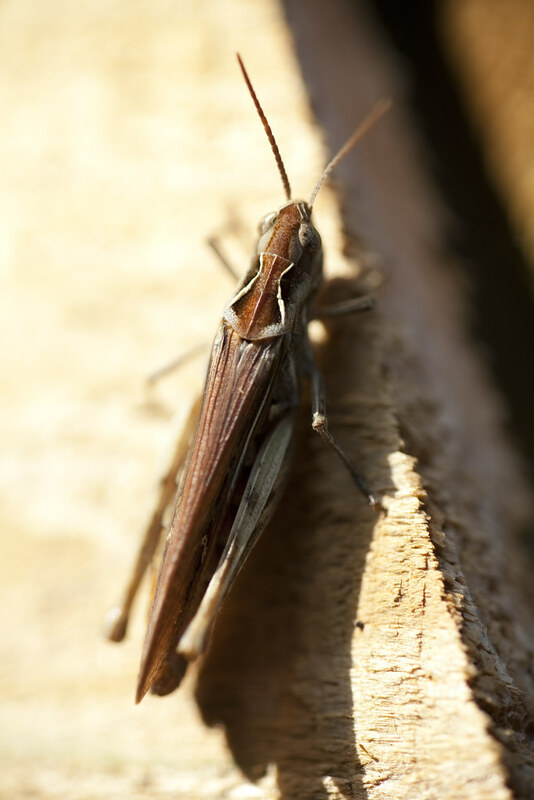 A truly evocative summer sound, produced by grasshopper stridulation by which a row of minute, evenly spaced pegs on the largest joint of the hindlegs is rubbed over the more prominent veins or ribs on the forewing. Just a short post tonight as we’ve had a long weekend of traveling, all the way to Suffolk and back for a friend’s 40th birthday. A very late night, the first we’ve spent away from Joe, and the 400 miles mean I’m more than ready for a decent night’s sleep in our own, delicious bed.